It’s no secret that Filipinos love rice. We devour them every single day. In fact, most of us do not consider meals a meal unless we enjoy it with some good old rice. But what if you are already getting bored with eating your plain rice day in and day out? Well, you can take comfort in the fact that there are different ways to prepare rice. In fact, you can give it a little Oriental spin and make it interesting and exciting all over again. The Yang Chow Fried Rice Recipe is a classic rice dish that originated from eastern China. Compared with traditional style fried rice, this recipe is much tastier. This is perfect for the entire family. Adults and kids love it for its distinct taste and colorful appearance. Seeing all the meat and vegetables mixed together makes this a visually-attractive and a tummy-satisfying meal. Yang Chow Fried Rice dish can be a rich source of calories, carbohydrates, fat, protein, and sodium so it’s a really healthy alternative to the usual rice. Although usually served in Chinese restaurants, you can always prepare this one straight from your kitchen as long as you have the time and the needed ingredients. In large a bowl, break the refrigerated rice to separate grains. In a large wok over high heat, pour 1 tablespoon of Canola oil. Saute onions and garlic then cook until soft. Add the chorizo bilbao and cook for about 3 minutes. Add the shrimp and cook until color changes to pink. Add green peas and cook for 2 minutes then remove from pan and set aside. In the wok pour 1 tablespoon of Canola oil then add the well beaten eggs then cook then allow the eggs to set for about 1 minute. In the wok, add another 1 tablespoon of Canola oil and when its smoking hot, add rice and cook for about 2 minutes. Using the back of spoon, break the eggs into pieces, set aside. Add shrimp and chorizo bilbao mixture, soy sauce and green onions. Gently toss all the ingredients to combine. Season with black pepper and salt then mix well. Put-in the scrambled egg and green onions then cook for 2 minutes while mixing with the other ingredients. Yang Chow Fried Rice is a healthy alternative to the usual rice. Thank you for the recipe. 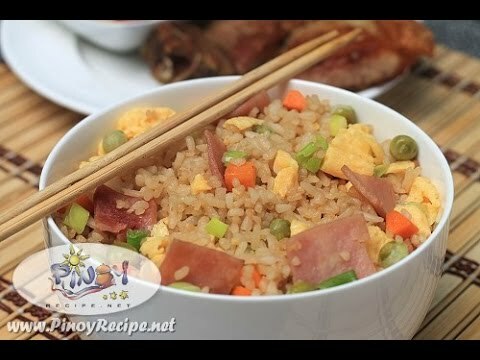 I love fried rice and this looks so delicious.I will definitely be trying it.